In this tutorial we’ll go over using the included Softaculous to install a WordPress website on your cpanel web hosting account. 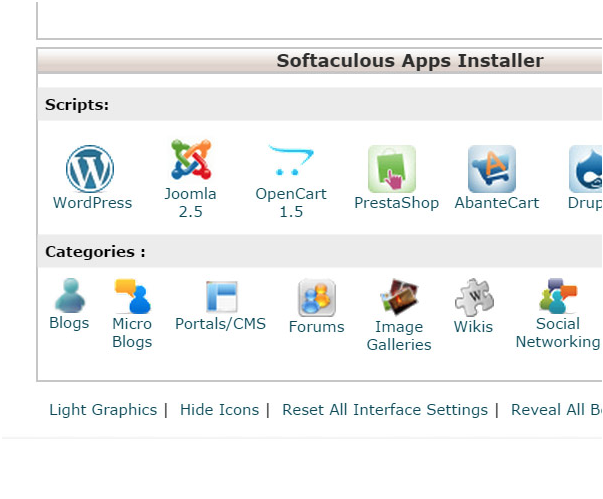 First, log into your cPanel account & locate the Softaculous installer as shown below & click it. After clicking the Softaculous installer icon, you’ll be taken to the installer. The next step will be to hover over the Worpress icon then click the blue “Install” button. From here, you will have a few options to choose from. You will be able to select the domain to install WordPress on (if you have multiple addon domains) as well as the directory. If you want WordPress to be installed in a sub-directory, you can specify it in place of the “wp” shown in the directory field. This means you will go to http://yoursite.com/wp to view the WordPress site. If you want WordPress to be displayed in the root, you would need to remove the “wp” from the directory field and leave it empty. Username: Enter in a stronger username that is not easily guessed. For example, many hackers & malicious users know that most people simply choose “admin” as the default username. This means they now only have to guess the password. Password: It’s also recommend to use a strong password with uppercase, lowercase, numbers & special characters. At least 10-15 characters is recommended. Table prefix: We recommend changing this away from the default – a similar naming convention such as wp3he6_ will work – you can randomize the prefix for the database for added security. Keep in mind though, a number of steps must be performed to secure WordPress, this is only 1 of many. 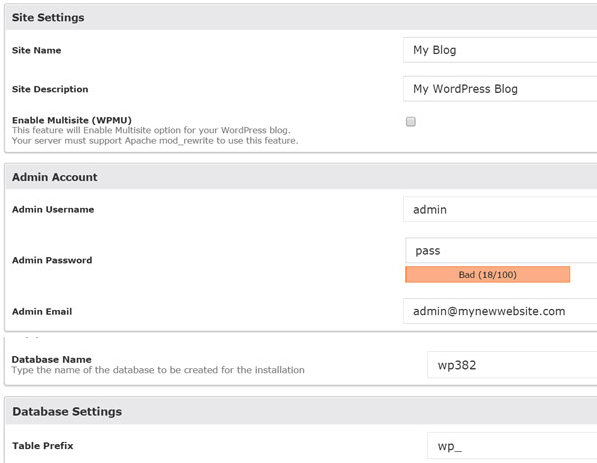 We also recommend installing the “Limit Logins” plugin for WordPress. By default, this is not installed as the check box is unchecked. Simply checking the checkbox will install this plugin. The plugin will block login attempts by IP address for the configured value for the number of failed logins to the WordPress site. There’s also a number of “Advanced” options found under the Advanced Options tab. These can be enabled by preference if you’d like automatic backups to run or automated upgrades. Please note, the automatic backups will count against your storage space. We recommend downloading your backups from your hosting account to your PC as we remove backups from our servers (generated backups) every 24 hours. Storing large amounts of backups can cause our daily R1Soft backups to fail. 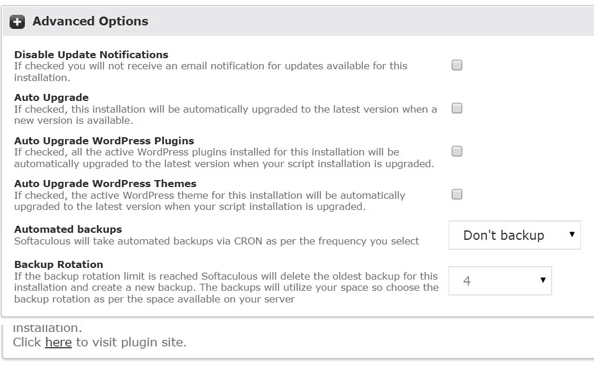 Finally, you have the option to install a WordPress theme (aside from the default, which will automatically be installed) & to complete the installation. You can specify an email address in the box under the install button & the installation details will be sent to that email. If you choose use the email options, we recommend changing your WordPress password after logging in as the email contains the WordPress password. After clicking the “install” button, your WordPress website will be installed. You should now be able to browse to your domain and view your WordPress site.